Are you a husband, son, or brother working hard to provide care for a loved one with Alzheimer's disease? If so, you're not alone. A study from the Alzheimer's association reports that between 1996 and 2011, the percentage of men among all adults caring for a family member with Alzheimer's or dementia more than doubled, rising from 19 to 40 percent. More broadly, men now represent as much as 45 percent of all family caregivers. These figures challenge the traditional view that caregiving is primarily a role taken up by women. It may also help more male caregivers to realize that there are millions of others just like them- a community they can reach out to for help, or just to share experiences with. 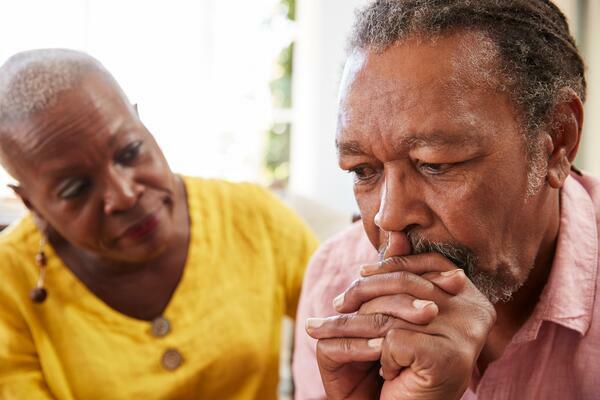 Because Alzheimer's affects more women than men, as the disease becomes more prevalent across the nation more men inevitably find themselves in the position of being a caregiver to their spouse. This is coupled with the fact that as the size of families shrank over the past century, it's more likely that a son will find he's the only one equipped to take care of mom or dad than in decades past, when more siblings meant it was more likely a daughter would be available to be the primary caregiver. As anyone who has taken up the role knows, caregiving is exhausting, both physically and emotionally-no less for men than for women. Spousal caregivers have the additional burden of experiencing strain in a relationship thee likely relied on for emotional support and companionship for decades. It is estimated 3 million men care for an ailing spouse full time. While much of the prevailing advice and information about caregiving is universal, researchers have found some significant differences between male and female caregivers. For example, men feel less comfortable than women with hands on care and the intimate interactions required during caregiving. Men also tend to conceal their feelings and emotions, more-so than women. Due to gender stereotypes, men are expected to maintain a tough, hardened exterior. The reality is, male caregivers require the same assistance and support women caregivers need. The expectation that men should always act strong and resilient causes them to refrain from reaching out, but caregiving should not be left solely in the hands of the caregiver. Caregivers should never feel embarrassed or ashamed to ask for help. Receiving support will not only help the caregiver in the long run, but also the person being cared for. When caregivers take time for respite, they return to their caregiving duties with more patience, understanding and willingness to accept challenge. Know that you are not alone. Almost half of all caregivers are male, and the majority experience feelings of loneliness, isolation and mental exhaustion. There are several support groups online, such as the by Home Watch Caregivers. There is also a support group specifically for male spousal caregivers. The Facebook Community Caregiver Nation has over 3,000 members, many of whom are male. The group shares inspiring stories, advice, and motivation with each other every day. If you are looking for a space to ask others for help or advice, Caregiver Nation is an incredible and supportive community that is a great option for any caregiver, male or female.